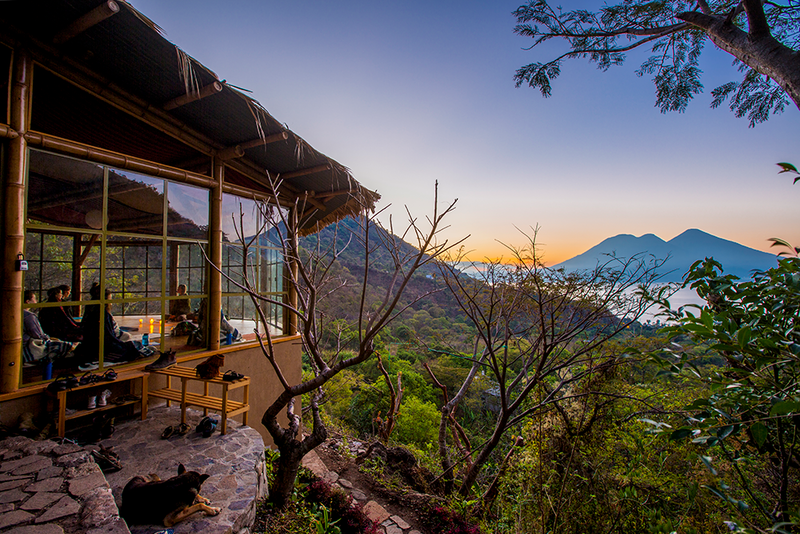 Enjoy the peace and tranquility of mountains looking out over Lake Atitlán towards volcanoes San Pedro, Toliman and Atitlán. Offering a unique retreat space within a tropical forest with amazing views, comfortable beds, delicious vegetarian meals, daily yoga and meditation and friendly community living. The Yoga Forest shares conscious living as a spiritual practice, offering a unique retreat space for self connection, connection to the Earth, and personal growth. Live, work & play harmoniously in nature, creating inclusive abundance and a safe space for personal transformation and authentic self expression. Through intercultural relationships of respect, we weave together local and global visions that inspire positive social and ecological impacts in the world. San Marcos la Laguna is a small Mayan village on Lake Atitlán in the western highlands of Guatemala. It has become a Mecca for international travelers attracted by its beauty, tranquility and diverse options for spiritual exploration and therapy. Terraced into the side of a cliff, The Yoga Forest is a twenty five minute hike up into the valley from Lake Atitlán. You can climb our unique cliffs, swim and paddle board in the lake, hike the volcanoes, or just relax in a hammock, all while finding authentic connection within a vibrant community.